Here are some classic and fresh new looks in footwear. I really like the Oxford for girls trend going on right now. Oxfords look super cute paired with everything from floral dresses to shorts. 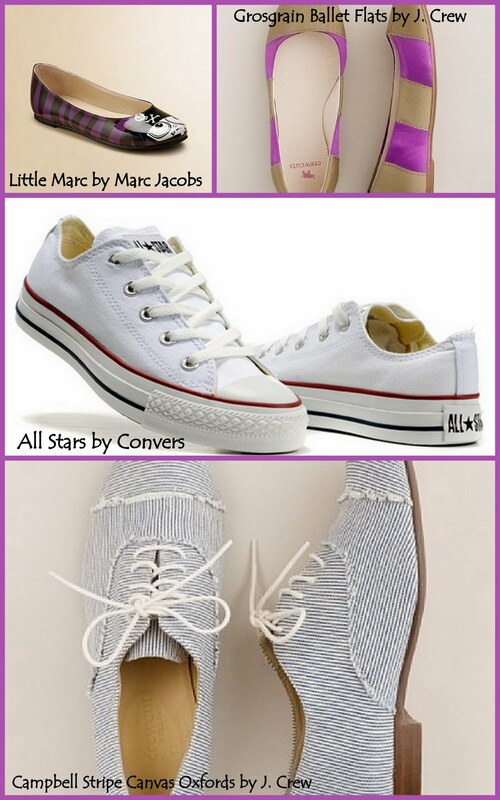 Marc Jacobs has a line of shoes for youth called Little Marc. I like the little Emo girl character he has created and put on a ballet flat, very different. J.Crew always has a great line of shoes for kids, the stripped grosgrain with a splash of pink is a great choice. And last but not least for your little girl, a classic pair of Converse All Stars in crisp white. 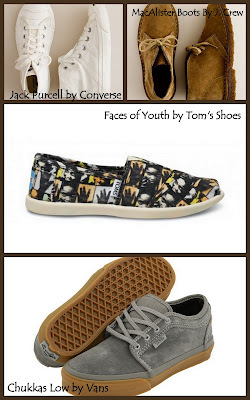 For the boys I like the new line of Tom's for kids line, his shoes are simple, comfy & stylish with a cause, I like the Faces of Youth print. Grey sued Chukkas by Vans are always a good pick to go with anything and for every occasion. J. Crew's Mac Allister Boots are so handsome and sturdy and would be a great addition to your little mans closet. Of course I also have to end with another Converse classic, the Jack Purcell High Tops, also in crisp white! All these picks will have your little one putting their best foot forward!!!! I really love the designs and color of this shoes. They are all lovely.